This post is sponsored in conjunction with PumpkinWeek . I received product samples from sponsor companies to aid in the creation of the PumpkinWeek recipes. All opinions, as always, are mine alone. 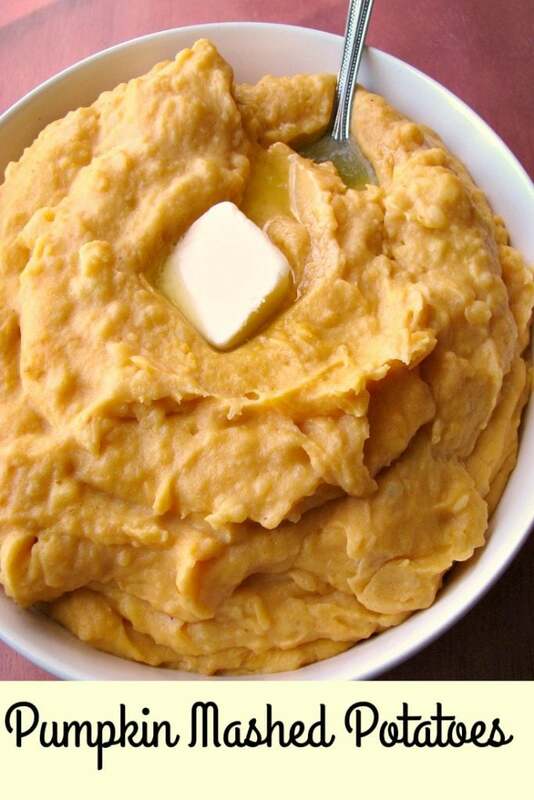 These creamy Pumpkin Mashed Potatoes, made with pumpkin puree, light cream, and brown sugar, make a perfect Thanksgiving side dish. Welcome to day 4 of #PumpkinWeek 2018 hosted by Love and Confections and A Kitchen Hoor’s Adventures! You can read all about the giveaway prizes right here. Oh, my gosh! I had been thinking about making Pumpkin Mashed Potatoes for #PumpkinWeek for a long time, but they turned out better than even I expected! So creamy, just the right amount of pumpkin, a touch of brown sugar that just gave the mashed potatoes extra flavor, not really sweetness. I think they are the best mashed potatoes for Thanksgiving. 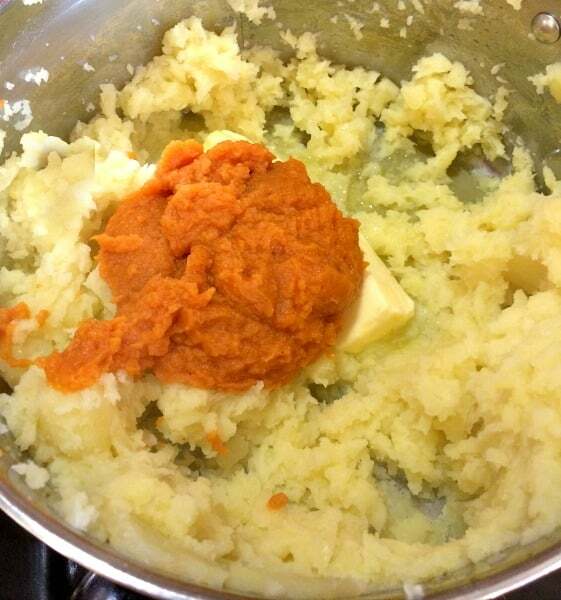 This isn’t a “mashed” potato recipe, exactly. These are whipped. Over time I’ve learned how to make whipped potatoes that aren’t gummy. These mashed potatoes are not lumpy, either. Too be honest, there were a few lumps, but not many. Most of the potatoes are perfectly smooth. Excuse, me, I have to go get a bowl of leftover pumpkin mashed potatoes. I figure one large potato per person, so this recipe should be enough for 6 people. Start by peeling and slicing Yukon Gold or yellow potatoes. You can slice them however you want, for this recipe I sliced them about 1/4 inch thick and they were ready to mash within 20 minutes of starting the stove. 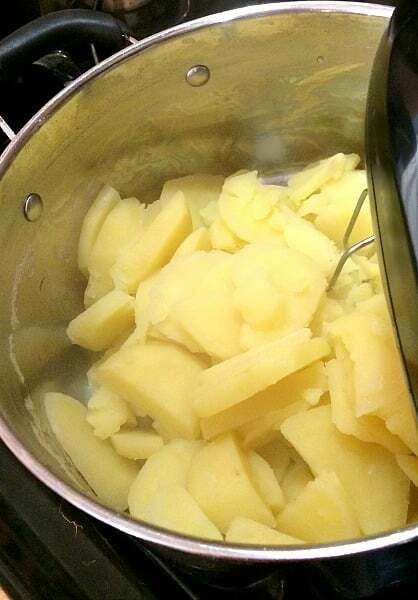 As you are slicing the potatoes, place them in a large pot filled with cold water. Once all of the potatoes are sliced, drain the water out of the pot by tilting it and using a plate or colander place over the pot to keep the potatoes in the pot. Fill the pot once again, and drain again. This removes some of the starch from the potatoes so they are less sticky when whipped. Fill the pot again with water, and place on the stove over high heat. Bring to a boil and let boil until the potatoes are tender. Drain, keep the potatoes in the pot and return to the stove with the heat off. Lightly whip the potatoes on low using an electric hand mixer. You can also whip them in a stand mixer, and then return to the pot to finish on the stove. Add melted butter, pumpkin puree, and brown sugar. Whip again on low, stopping and checking for smoothness, until desired consistency is reached. Be careful not to over mix. Once mixed, pour in light cream. Turn the heat back on to medium-low and cook, stirring often, until the cream is absorbed into the potatoes. Stir in salt, then spoon into a serving bowl and serve hot. 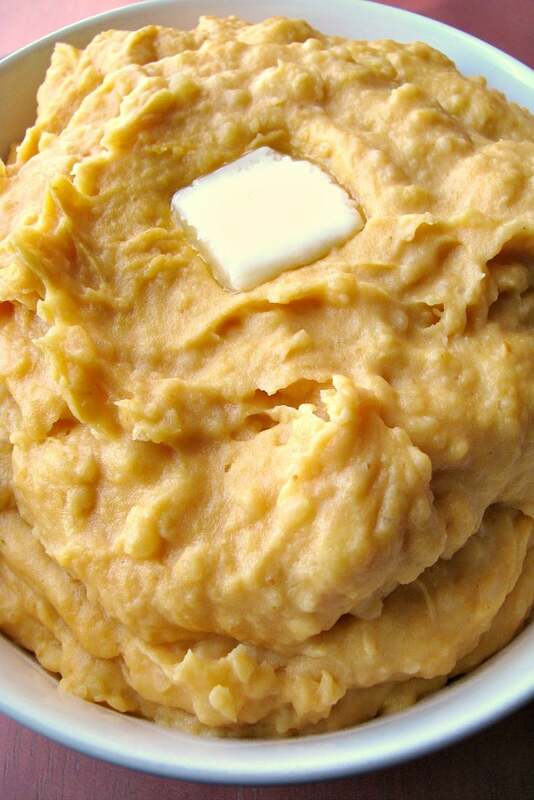 Read on after the recipe for Pumpkin Mashed Potatoes to see all the other recipes shared today. 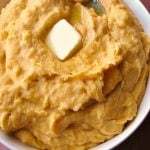 These creamy Pumpkin Mashed Potatoes, made with pumpkin puree, light cream, and brown sugar, make a perfect Thanksgiving side dish. 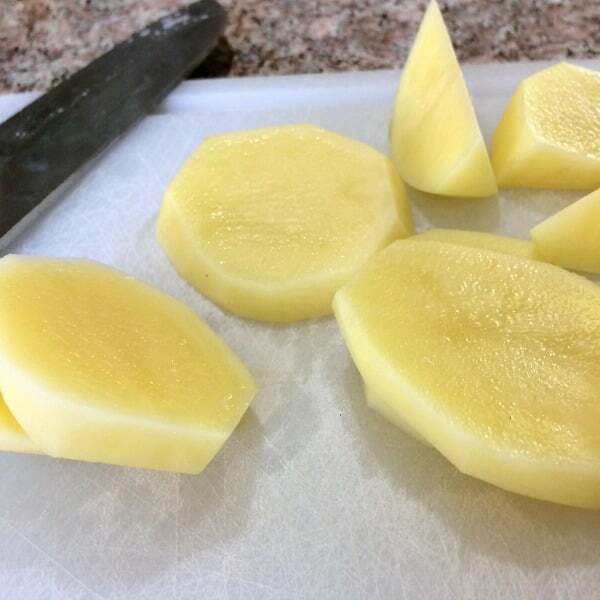 Peel and slice Yukon Gold or yellow potatoes around 1/4 inch thick. Place them in a large pot filled with cold water. Once all of the potatoes are sliced, drain the water out of the pot by tilting it and using a plate or colander place over the pot to keep the potatoes in the pot. Fill the pot once again, and drain again. Add melted butter, pumpkin puree, and brown sugar. Whip again on low, stopping and checking for smoothness, until desired consistency is reached. Be careful not to over mix. Once mixed, pour in light cream. Turn the heat back on to medium-low and cook, stirring often, until the cream is absorbed into the potatoes. What a wonderful Thanksgiving side dish these would make!